Here are 2 white rectangular pieces I got from my friend, the connoisseur collector. She didnt want them because she thought that they were not collectible enough. Maybe she's right, who'd want these dusty rectangles ? Yeah, but I the gypsy collector just grabbed them ! I am not known as Garang Guni for nothing. Heh! Heh! 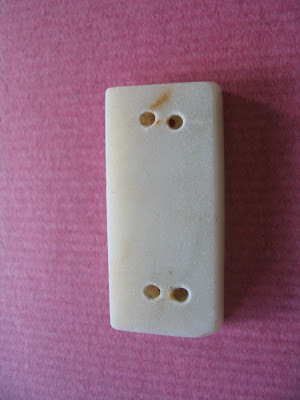 Each is pierced with six holes for attachement and the material looks like glass imitating jade but I am not sure. Perhaps it may be calcite. In the book "Chinese Antique Glass" there are belt sets made up of components such as what I show. These examples appear in p.57, 62, 66. So it would not be too presumptious for me to think that my rectangles had once been used to make up belt sets too. The book gave timelines ranging from Tang to Ming, quite a lengthy and safe timeline, and I hope I will not be censured by glass shifus for following this guideline. These rectangles are completely plain and unadorned so I am guessing that they maybe "grave goods" or they maybe used by less wealthy folks who could not afford jade. 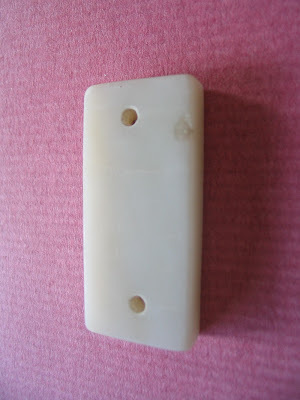 Here's another belt piece which is also rectangular in shape and smaller than the above pieces. It may have been used as a "filler" or end spacer, examples of which can be seen in "Chinese Antique Glass" p.68. It is pierced on one side with two vertical holes and on the reverse side with two ox-nosed holes and the two sets of holes converge.